It was a fun mix of surprises and the expected at this year’s Housing Design Awards gala Saturday night. as the Greater Ottawa Home Builders’ Association recognized its own. The biggest surprise of the night was the showing by newcomer Neoteric Developments, which scooped up four awards — three of them for the home of company owner Shneur Bielak — including the coveted Ottawa Citizen’s People’s Choice Award. One of the special achievement awards, the People’s Choice Award is voted on by the public. Almost 5,000 determined a shortlist of 14 projects through preliminary rounds of voting, more than 1,650 of them casting a vote in the final round either online or at the Ottawa Fall Home Show in September. Interestingly, four of the 14 finalists were projects by Neoteric and three of them were also Bielak’s home. Neoteric is a five-year-old luxury custom home company run by Bielak, a former cantor with a love for design, and Marco Manconi, who was the city’s project manager for the Lansdowne redevelopment and is currently on a leave of absence to work for Neoteric. Neoteric had an impressive seven projects nominated for the awards. Industry veteran Minto Communities notched a slight lead on the trophy count, winning six awards for everything from model homes to condos and communities. And the dream home it built last year for CHEO’s Dream of a Lifetime Lottery won three awards — in a production home and two custom bathroom categories — sharing two of them with Laurysen Kitchens. and a custom west-end home that earned custom kitchen and bathroom honours for Astro Design Centre. 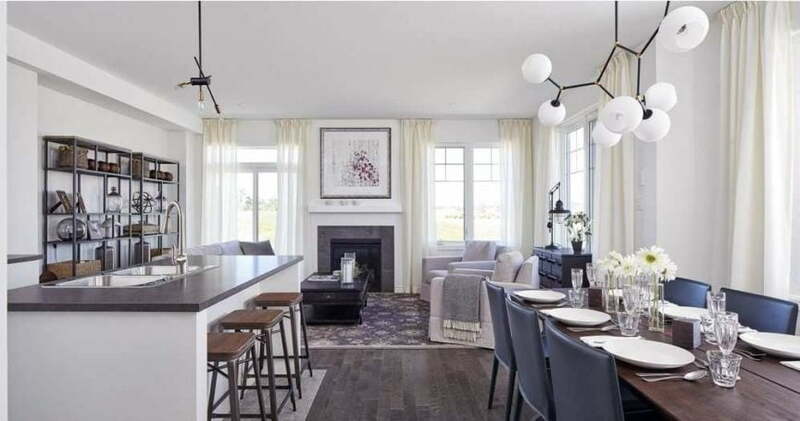 Other multiple award winners included eQ Homes, named production builder of the year as well as winning for its new double-car garage corner town and (along with Hobin) for its innovative Greystone Village in Old Ottawa East. “It’s a huge win for our company,” said eQ vice-president Josh Kardish, who is also the president of the association. The idea that the company could be recognized after just nine years in the industry says a lot about “the systems” they have put in place, he said. Tartan Homes was a double winner for a model home and a kitchen, Maple Leaf Custom Homes won for two custom homes with Simmonds, and Project1 Studio was named the designer of the year and won a renovation category. It was no surprise that RND swept the green categories. Owner Roy Nandram has built a career promoting sustainable design and has dominated the green categories for years. Three of the four entries in the two green categories were his projects. RND was also the only entry for the custom builder of the year, virtually guaranteeing that Nandram would get the win. It’s the third time in the past five years he has been named custom builder of the year. There was a strong showing by other newcomers besides Neoteric who took home hardware. They included production builder Caivan Communities, Arca-Verde Inc., builder/renovators Sunter Homes, Sherbrooke Urban Developments and Novera Homes, and Shean Architects, making its first foray into the awards after stepping out from under the tutelage of Simmonds. The always popular renovator of the year award, which often sees the city’s top renovation companies jockeying for bragging rights, went to Lagois Design-Build-Renovate, which had two wins on the night. Interestingly, all three finalists in the renovator of the year category — Lagois, Amsted and OakWood — were the same as those in last month’s provincial housing awards, the Awards of Distinction put on by the Ontario Home Builders’ Association. The provincial winner was OakWood. There was a bittersweet moment towards the end of the evening when the Enbridge Hall of Fame Award was given posthumously to Friedemann Weinhardt of Design First Interiors, who received a standing ovation. The respected designer, who was named GOHBA’s designer of the year last year, died unexpectedly in August after falling from a ladder. The awards were given out at a gala at the Shaw Centre attended by some 500 of the industry’s top companies.